The signature class-leading capability and durability of the Ford F-150 are enhanced for 2011 with projected class-leading fuel economy and performance. Ford F-Series, America’s best-selling truck for 33 years running, now comes equipped with an all-new powertrain lineup that will deliver best-in-class horsepower, torque and projected fuel-economy leadership. Another fuel saver is the addition of class-exclusive electric power-assisted steering (EPAS) to the 3.7-liter V6, 5.0-liter V8 and 3.5-liter EcoBoost powertrains. The EPAS system replaces a conventional hydraulic system, which runs continuously off the engine, with a system that draws power only when needed. Additionally, EPAS enables several other driver convenience technologies and provides better steering feel. Ford is the first manufacturer to widely offer EPAS on full-size pickup trucks. SelectShift functionality is available in the six-speed automatic transmission. SelectShift allows customers to select the desired gear. The transmission also features progressive range select, which allows the customer to lock out the available gears while in Drive. Also enabled is tow/haul mode, which provides better control when hauling a heavy load or towing a trailer, especially when descending grades. The improved system uses an array of sophisticated electronic sensors to better predict the driver’s need for a downshift to provide engine braking and enhanced control. Along with improved fuel economy, another key benefit of EPAS is that the steering gear can be more precisely tuned for optimum feel for on-road and parking efforts. The tuning is software-based, so the steering can be programmed and essentially customized to each model based on wheelbase, powertrain and other factors. in-mirror rear view camera screen are among the new customer conveniences available. New clusters include the available 4.2-inch LCD message center screen’s menu options display, which includes information related to fuel economy, towing performance and off-roading. The menu is navigated through a five-way button on the steering wheel. The screen in the rearview mirror for the rear view camera option not only is larger (increased from 2.5 inches to 3.5 inches), it has higher resolution than the outgoing version. Further, customers can zoom in or out, which is particularly helpful during towing hookup and other towing operations. Other new standard and available content includes a three-point safety belt and head restraint for the middle passenger in the front seat, express up and down front windows, 110-volt outlet, Remote Start, telescoping steering wheel, HD Radio™ and perimeter alarm. 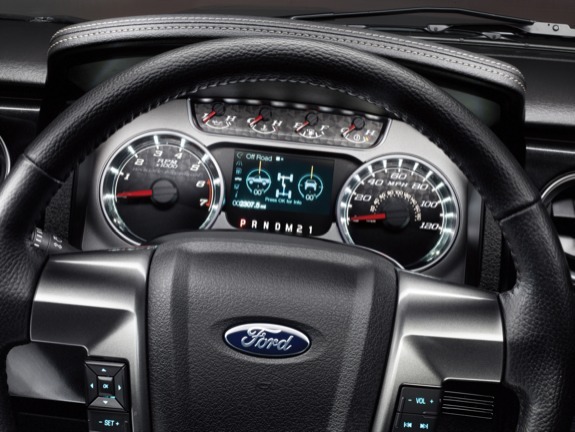 Two technology stalwarts of Ford trucks are available again for 2011 – SYNC® and Ford Work Solutions™. SYNC with Traffic, Directions and Information leverages industry-leading voice-recognition software, integrated GPS technology and a Bluetooth®-capable mobile phone to deliver personalized traffic reports, precise turn-by-turn directions and up-to-date information including business listings, news, sports and weather – without the need for a built-in navigation system. Ford Work Solutions features an in-dash computer that provides full high-speed Internet and wireless accessories that include a mouse and printer; Tool Link™, a Radio-Frequency Identification (RFID) asset tracking system that enables customers to maintain a real-time inventory of tools or equipment stored in the vehicle; Crew Chief™, a fleet telematics and diagnostics system; and Cable Lock System to secure large tools or equipment in the cargo area. New for the 2011 Ford F-150 are a seat-integrated shoulder belt for the front middle seat, a head restraint for the second-row middle seat and integrated spotter mirrors. These additions join numerous standard safety features, including an advanced safety cage with high-strength steel and six standard airbags. 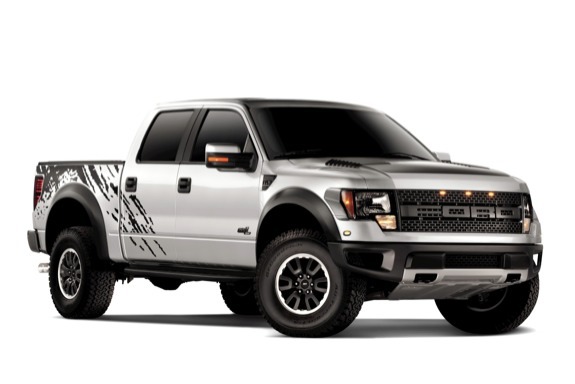 The basic trim levels – XL, STX, XLT, FX2/FX4 and Lariat – are again offered in addition to King Ranch®, Platinum, SVT Raptor and Harley-Davidson F-150. Joining the XLT lineup is the new XLT Custom package tailored for customers who opt for the 3.7-liter V6. Available in all cabs in two-wheel-drive configuration, the XLT Custom exterior includes 18-inch machined aluminum wheels, chrome exhaust tip, body-color 4-inch running boards, body-color front and rear bumper fascias, unique grille with body-color surround and chrome billet insert. The 2011 F-150 FX2 and FX4 are now more unified, with FX2 customers able to share the sporty yet rugged off-road look originally pioneered by the FX4. The FX2 and FX4 share common grilles, 18-inch wheels (20-inch wheels optional), body-color power mirrors, body and tailgate handles, black surround headlamps and taillamps. The trucks are differentiated by unique badging on the box and front fenders. Both the XLT and Lariat have added off-road packages, including electronic locking rear differential, skid plates and off-road-tuned front and rear shock absorbers. 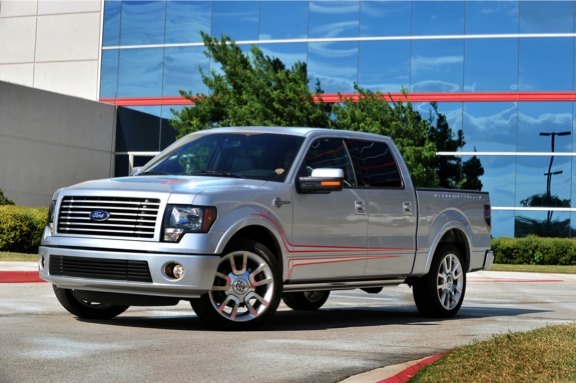 Returning to the F-150 lineup for 2011 is the popular Lariat Limited, which debuted in 2008. This premium offering, limited to 3,500 units in the U.S., is powered by the 6.2-liter V8 rated at 411 horsepower. Available in White Platinum tri-coat only, the Lariat Limited features chrome details and finish, including chrome surround in the unique grille, chrome-trimmed power-deployable running boards, chrome tie-down hooks and chrome “Limited” box-side lettering. Other exterior highlights include blacked-out headlamps and taillamps, body-color grille billets and unique lower fascia. The 22-inch polished forged aluminum wheels with body-color accents are complemented by a specially tuned suspension for more precise handling. Premium two-tone leather seat inserts highlight the interior, which includes leather-wrapped steering wheel with painted switch bezels, ambient lighting, brushed-metal “Limited” scuff plates and a wrapped center console lid with accent stitching, chrome ornament and engraved serialization plate with the vehicle identification number. “The 2011 Ford F-150 has all the best-in-class towing and payload capability and durability our tough truck customers demand and now takes a giant leap forward in fuel economy, performance and technology,” said Kuehn. 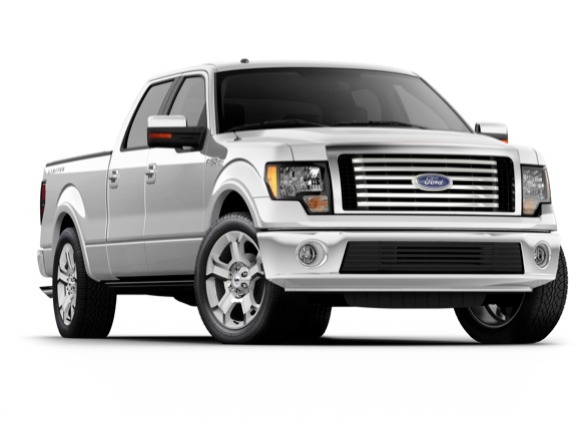 The 2011 Ford F-150 will be available in late 2010.